The Post Office raised rates again. Shipping sometimes costs as much as the item being sent. 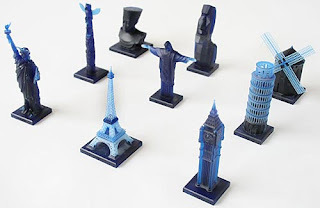 As the costs of collecting 3-D miniature buildings keep going up, have you ever wondered if they could be emailed? Designed by Héctor Serrano, these ‘Reduced Carbon Footprint Souvenirs’ can be send via e-mail and then built using a 3D Printer (stereolithography rapid prototyping). Neither standard production methods, nor transportation is required so the object’s carbon footprint is reduced to the minimum. The project questions the way objects are manufactured and new technologies are applied to propose alternative ways of reducing their impact on the environment. The souvenirs are being exhibited at the Hub National Centre for Craft & Design from April 11 to June 15. Building collector reader Scott D. sent me this tip and said, “I hope these don’t catch on.” I have to agree. Don’t get me wrong, I’m all for being environmentally conscious, but with the trend moving from metal to resin to plastic, I just can’t bear to downgrade to paper buildings. Besides, none of my metal souvenir buildings will ever end up in a landfill.